Editor(s): Sigut, A.; Jones, C.
The Bright Emissaries conference focused on all observational and theoretical aspects of Be stars and related objects, with an emphasis on the insight that can be revealed by understanding the physics of the underlying stars, disks and their interactions with the environment. This volume is of general interest to stellar astrophysicists and contains current research on massive star evolution, circumstellar disks, the Be phenomena, and star-disk interactions. It contains a broad selection of recent results, unsolved puzzles, and topics of interest related to massive stars with an emphasis on Be disk systems. The conference brought 70 researchers together, including a significant number of students, from six continents to share their current research results. The conference was organized to provide ample time for relevant discussions and collaborations. Each day there were two invited presentations given by preeminent researchers in the field: Stan Owocki, Jon Bjorkman, Gail Schaefer, Atsuo Okazaki, Thomas Rivinius, Dietrich Baade and Astrid Lamberts. 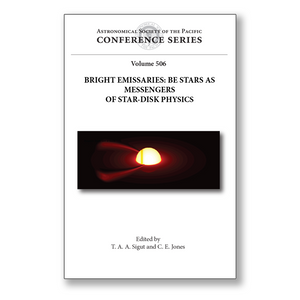 This volume includes papers from 33 contributed talks and 21 poster presentations organized into sections on the central star, circumstellar disks, and the star/disk connection to the environment.